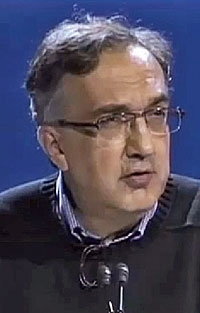 Sergio Marchionne: "The new architecture, which debuted (in Europe) with the Alfa Romeo Giulietta (compact hatchback), is the most advanced mass-produced car Fiat has ever had, and at Chrysler, Dodge will use it first." TURIN, Italy -- The Dodge brand will receive the first Chrysler Group product based on Fiat’s Compact Wide architecture, Fiat S.p.A. and Chrysler Group CEO Sergio Marchionne said today. The Fiat-based sedan will broaden Dodge’s offerings in the crucial compact segment. The Caliber compact hatchback is the smallest Dodge model available today. It will continue in its current form until mid-2012. The new Dodge compact sedan will be built in the United States and debut at the end of 2011. There will also be a high-mileage version that will get 40 mpg, Marchionne said. “The new architecture, which debuted (in Europe) with the Alfa Romeo Giulietta (compact hatchback), is the most advanced mass-produced car Fiat has ever had, and at Chrysler, Dodge will use it first,” Marchionne told analysts on a conference call today. Manufacturing a Chrysler model in the United States that is capable of delivering 40 mpg is actually the second of three milestones Fiat must reach to increase its stake in Chrysler to 35 percent from 20 percent now. Chrysler will reach the first of those three 5 percent milestones when it begins production of Fiat’s 1.4-liter FIRE MultiAir engine in Dundee, Mich., between the end of this year and the first quarter of 2011, Marchionne said. The first application of the 1.4 engine will be on the Fiat 500 minicar, which Marchionne confirmed will go on sale in the United States in January. Marchionne said Chrysler and the U.S. Treasury Department are currently fine-tuning details related to how Fiat could get the final 5 percent stake in Chrysler. Those talks are focused on Chrysler export targets and access to Fiat dealers, mainly in Latin America. “I think the issue could be resolved by year end and the conditions to get there could be reached in the second part of next year”, he said. The U.S. Treasury owns 9.85 percent of Chrysler.